Wyoming & U.S. Territory Acquisitions | Land Surveying Inc. If you have visited “The Local” coffee shop in downtown Gillette, you may have noticed this large antique map on the wall. As professional land surveyors, we have a passion for all things map-related, but this one was particularly fascinating. We wanted to provide a little historical background for our hometown friends visiting The Local so they could appreciate this unique piece of our nation’s history. After the American Revolution, the thirteen original colonies were ceded to the new nation of the United States. Over the next 134 years, the U.S. eventually added territory after territory through purchases, treaties, and wars, until in 1917 it reached the size that it is today. What’s most interesting to us Wyomingites, is that Wyoming’s location falls right at the intersection of four different territorial ownerships. Portions of Wyoming were acquired from France (Louisiana Purchase, 1803), Republic of Texas (1845), Mexico (1848), and Great Britain (Oregon Country, 1846). In fact, travelers across Wyoming can visit a landmark called the Tri-Territory Historic Site, on State Highway 28, about 13 miles northeast of Farson in southwest Wyoming. A plaque and stone masonry monument mark the physical intersection of the Louisiana Purchase, the Northwest Territory (also known as Oregon Country), and Mexico. How did surveyors identify this specific location? It’s the point where the continental divide crosses the 42nd parallel north latitude. The purchase of over 800,000 square miles from the Gulf of Mexico to the Canadian border is likely one of the most famous real estate deals in U.S. history. In 1801 President Thomas Jefferson initiated negotiations for its purchase. France agreed to the sale in 1803 for $15 million. The Louisiana Purchase provided access to lands beyond the Mississippi River, and almost doubled the size of the United States. 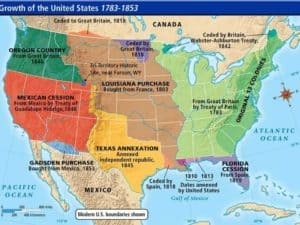 Most of the southwestern United States belonged to Spain at the beginning of the 19th century. Texas was annexed by the United States in March of 1845. By 1820, the territory of present-day Oregon, Washington, Idaho, and portions of Montana, Wyoming and British Columbia was shared by Britain and the U.S. In 1845 the U.S. began negotiations to divide the territory at 49 degrees north latitude, bisecting Vancouver Island. Americans felt that the United States had a “manifest destiny” to expand across the continent. Democratic presidential candidate James K. Polk promoted it even more with his campaign slogan “54 40 or Fight!” calling for a border at 54 degrees, 40 minutes north latitude. The 1846 Treaty of Washington set the border at the 49th parallel, but ceded all of Vancouver Island to Britain. The acquisition gave the U.S. valuable grazing and farm land, mineral reserves and coastal ports. In the Mexican Cession, a result of the Mexican-American War, Mexico ceded more than 520,000 square miles to the United States. It was almost half of Mexico’s North American possessions and included modern-day California, Nevada and Utah, and parts of Arizona, Wyoming, Colorado, and New Mexico. There were several other land acquisitions that eventually allowed the United States to reach from sea to shining sea, as can be seen in the map below. We suggest you stop in at The Local and enjoy this piece of history. 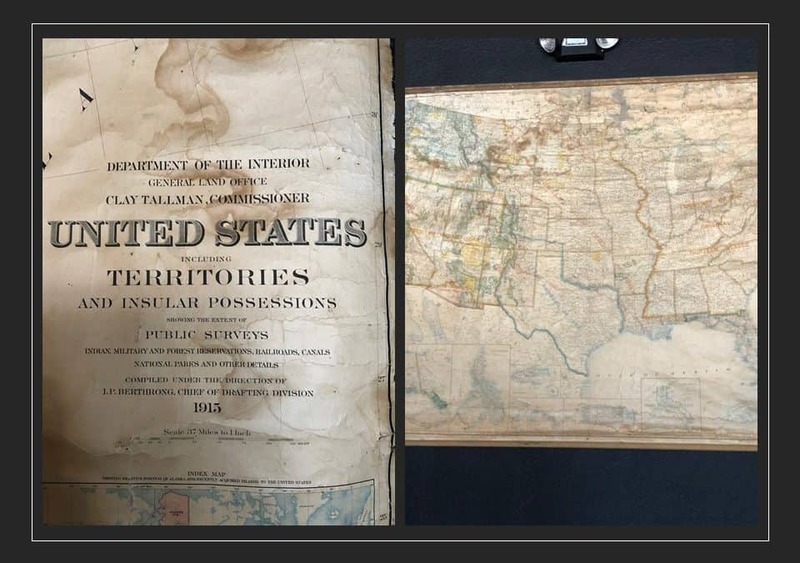 As land surveyors, we are happy to share our love of historical maps and markers with others, as we reflect on the history of our great nation. Now who wants to grab a latte and take a road trip to Farson? Jessica Maycock, GIS Technician. As a GIS technician with Land Surveying Incorporated since 2017, Jessica is responsible for preparing a variety of map deliverables and managing office-wide data through ArcGIS and AutoCAD software. She processes raw survey data and loads it into client-designed geodatabases to meet company data standards. Jessica holds a Master’s Degree in Biology (2006) and has 12 years of previous experience as a wildlife biologist and office manager providing biological consulting services to energy clients in Wyoming. What Does it Take to Be a Professional Land Surveyor (PLS)?